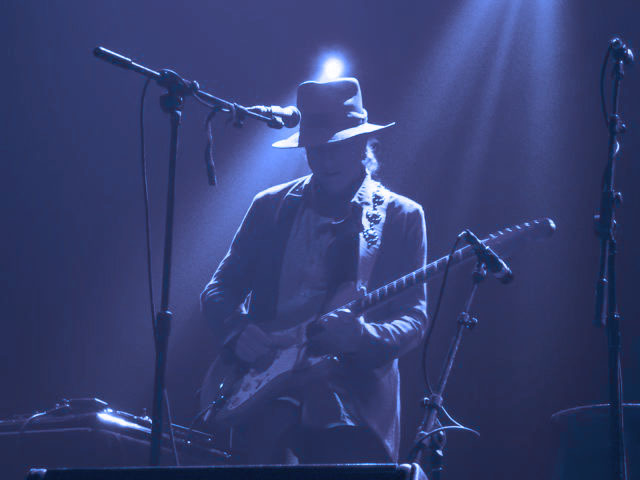 Gary Lucas is an American guitarist/songwriter who has played and collaborated with Leonard Bernstein, Captain Beefheart, Jeff Buckley, Chris Cornell, Lou Reed, John Cale, Nick Cave and David Johansen. Other collaborations include: Adrian Sherwood, Allen Ginsberg, Billy Bang, Bob Neuwirth, Bob Weir, Bryan Ferry, Damo Suzuki, Dave Liebman, DJ Spooky, Dr. John, Fred Schneider, Future Sound of London, Geoff Muldaur, Graham Parker, Iggy Pop, Jann Klose, Joe Lovano, John Sebastian, John Zorn, Kate & Anna McGarrigle, Kristin Diable, Mary Margaret O'Hara, Matthew Sweet, Melissa Mars, Onetwo, Patti Smith, Peter Hammill, Peter Stampfel, Richard Barone, Roswell Rudd, Sebastian Doggart, Steve Swallow, The Dark Poets, Van Dyke Parks, and Warren Haynes. Some of these collaborations appear on his retrospective album Improve the Shining Hour, which also features his film and TV music for ABC News, 20/20 and Turning Point. He has produced albums for composer/saxophonists Tim Berne and Peter Gordon, and for the French avant-rock band Tanger. He co-wrote Joan Osborne's Grammy-nominated song "Spider Web" from her triple platinum album Relish.